Kick cancer in the snowballs and honor John’s footsteps! 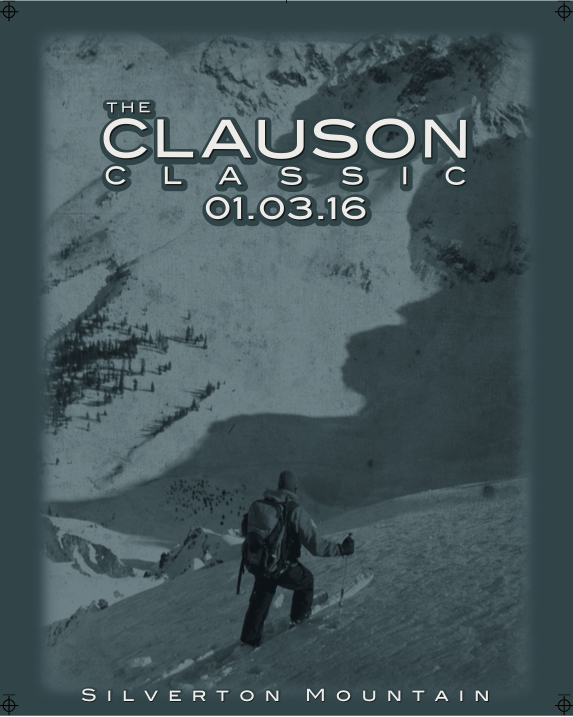 Join us for The Clauson Classic at Silverton Mountain on January 3rd, 2016. “Be Like John.” That’s what is written on the whiteboard in the patrol shack at Silverton Mountain. John Clauson was our Assistant Snow Safety director, guide and ski patroller. No mission was too hard, no load was too much, and nothing couldn’t be done without a smile and a humble admiration for the beauty of the San Juan Mountains. In honor of John’s legacy and to benefit those in need, Silverton Mountain is hosting the annual Clauson-style endurance race! See how many laps you can hike up the ridge while you raise funds for First Descents. The further you go and the more laps you get, the more points you will earn to win some awesome donated prizes. Points will be earned throughout the day at the base area as well so everyone can participate. Registration is now open on EventBrite. Plenty of Swag from Backcountry Access, K2 Skis, The North Face, Smith Optics, Fischer Bindings, Venture Snowboards, Red Bull and more! NEW THIS YEAR AT THE CLAUSON CLASSIC: We will be holding a Bone Marrow Registry Drive at the event assisted by BE THE MATCH. If John had lived long enough, his only hope for life would have been a bone marrow transplant. It’s as easy as filling out a short form and swabbing your check with a Q-tip! We will have lots of info there for you at the event or you can sign up online to be a donor. First Descents is a Colorado-based non-profit providing life-changing outdoor adventures across the world for young adults impacted by cancer. Camps include activities such as surfing, kayaking, rock climbing, river rafting, mountain climbing, and more. COST: Race entry is $35 and includes a t-shirt this year! If you are registered for the event, you can buy a lift ticket the morning of the event for just $25. You must purchase a lift ticket or have a current season pass to participate in the race. REGISTRATION: Register online until 6pm, January 2nd. You may also register at the mountain on the morning of the race beginning at 8 am. Please be checked in and registered by 8:30 am. REQUIRED GEAR: Like any day at Silverton Mountain, you must carry beacon, shovel and probe. You must show these when you check in at the tent. This gear is available to rent at the mountain as well the day of the race. You must also sign a waiver and have a lift ticket or season pass. Registration fee for the race is $35, participants can buy a $25 lift ticket the morning of the event at the mountain. Fun giveaways for participants at the end of the day! Don’t wait, register now and help us honor John.